This New database dialog is accessed from the File->New... menu item. It enables you to create a new PGN database. Enter the file name of the database you wish to create and click Save. 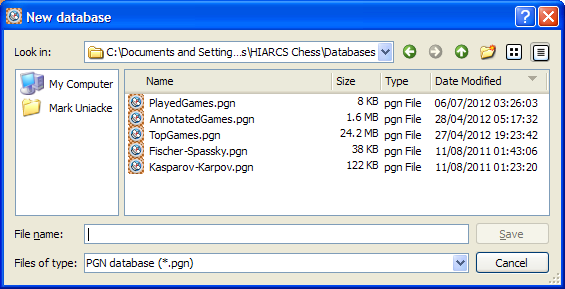 You can also browse to another folder if you wish to create a PGN database in a different folder. The reason for this change is to make it easier/quicker to create a new database tab to enter a position or game. Often that position or game might not be saved so this enhancement makes that a much quicker operation. It is also often easier to know what name to use for the new database once its contents is known.